Spanish painter. He was trained in Seville around 1660 in a milieu dominated by the painting style of Bartolom Esteban Murillo. His membership of the Academia de Pintura in Seville is recorded from 1664 to 1672, as is his marriage in 1677. He was buried in the church of S. Pedro, Seville, in 1724. Although Gutirrez worked as a painter in Seville for half a century, few of his paintings are known. 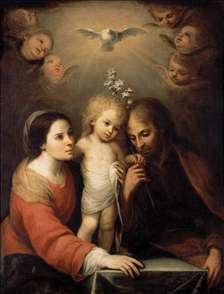 The earliest, signed and dated 1698, is the Virgin and Child with Augustinian Saints, representing St Augustine, St Nicholas of Tolentino, St Monica and St Rita of Cascia (Carmona, La Trinidad). A large signed lunette canvas, St Dominic Comforted by the Virgin and Martyr Saints (Seville, Museo Provincial de Bellas Artes), dated 1711, provides the basis for attributions. Against a background of golden clouds, the red and blue of the Virgin s mantle contrasts with the black-and-white habit of St Dominic. The tunics of the surrounding child martyrs blend harmoniously into the whole, and the sweet, contemplative faces of these young female saints are clearly influenced by Murillo. The Assumption of the Virgin (London, Wallace Collection), attributed to Gutirrez and almost certainly by him, is based on an engraving by Schelte a Bolswert inspired by two versions of the theme painted by Peter Paul Rubens (c. 1611-15; The Hague, Mauritshuis; Vienna, Kunsthistorisches Museum).